Biel (Biel/Bienne since January 2005), an important city (pop. 1950 48,401; pop. 2004 50,295) in the canton of Bern (Switzerland) at the foot of the Jura chain, was a thriving town in the age of the Reformation. Thomas Wyttenbach was the reformer of the city. As early as 1505 he attacked certain Catholic doctrines, such as indulgences. As professor of theology at the university of Bern he influenced Zwingli, who was his student. In 1519 Wyttenbach returned to Biel and until his death (1526) he promoted the Reformation there in the face of great obstacles. The Reformation was, however, not successfully introduced into Biel until 1528. In 1528 some Swiss Brethren leaders came to Biel, among them Blaurock. It is thought that there was a considerable Swiss Brethren congregation in Biel at that time. Füsslin reports, "the Anabaptists have also slipped into Biel and these named ones are reported: Bernhard Sager of Bremgarten, Thomas Schmär of Neustadt in Franconia, Hanssman Seckler of Basel, Hans Meyer called Pfister-Meyer of Aarau, Hans Toblinger of Freiburg in Uechtland, Ulrich Uller of Brunnen, Georg vom Hause Jakob of Chur, Ulrich Hänger of Bern. These met secretly in the oak woods near the 'Big Stone.' When they were expelled they withdrew to the Bittenberg. On March 9, 1528, the rule was passed concerning them, that if they came back they should be expelled from the canton. It was publicly announced in the churches that nobody should lodge Anabaptists or detain them in any way on penalty of a severe fine." Soon the traces of Anabaptists in Biel disappeared; they were then found later in the adjoining Jura district. In the 18th century there were several small congregations a few miles north of Biel, e.g., in Plagne (Plentsch), where Nikiaus Knör, a preacher expelled in 1757 from Bucheggberg (canton of Solothurn), served his brethren in isolated mountain farms until his death in 1773. Not far from Biel is the village of Pery (Büderich), where Peter Burkhalter, ordained elder in 1766, lived. Aurele Robert, "L’ Anabaptiste ou La Ferme bernoise. Source: Mennonite Encyclopedia, vol. 1, p. 21 (illustrations). Büderichgraben was also the home of Jakob Marti and David Baumgartner. At the beginning of the 19th century the congregation, now extinct, numbered 89 members. Täufer-Bänz must also have lived not far from Biel in the 18th century. It is very probable that the stately home of this preacher, who earned his bread by farming a little land and weaving, was the subject of the painting by Aurele Robert, "L’ Anabaptiste ou La Ferme bernoise," now found in the museum at Lausanne. Biel has been an important market center for the Mennonites in the southern Jura since the 19th century. 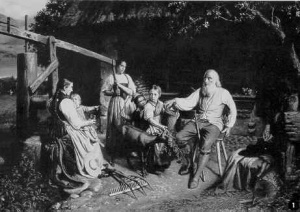 A number of Mennonite families settled in Biel for business reasons. In 1950 there were about 50 members of Mennonite congregations living there. The group met monthly in the home of the Gruber-Geiser family and was served by elders Samuel Geiser and Jakob Lehmann, both resident in Brügg near Biel. The Neutäufer or Fröhlichianer were found in considerable numbers in Biel and vicinity. They had a church on Neumarkt Street in 1950. Füsslin J. C. Beiträge zur Erläuterung der Kirchen-Reformations-Geschichten. Zürich, 1741. Geiser, Samuel. Die Taufgesinnten-Gemeinden : eine Kurzgefasste Darstellung der wichtigsten Ereignisse des Täufertums. Karlsruhe : H. Schneider, . Geiser, Samuel. "Biel (Kanton Bern, Switzerland)." Global Anabaptist Mennonite Encyclopedia Online. 1953. Web. 20 Apr 2019. http://gameo.org/index.php?title=Biel_(Kanton_Bern,_Switzerland)&oldid=91119. Geiser, Samuel. (1953). Biel (Kanton Bern, Switzerland). Global Anabaptist Mennonite Encyclopedia Online. Retrieved 20 April 2019, from http://gameo.org/index.php?title=Biel_(Kanton_Bern,_Switzerland)&oldid=91119. Adapted by permission of Herald Press, Harrisonburg, Virginia, from Mennonite Encyclopedia, Vol. 1, p. 339. All rights reserved.